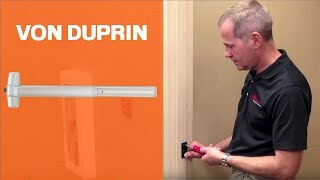 This Von Duprin 98EO rim exit device is an exit only function device which does not include a trim. It is available with Electric Latch Retraction, with cylinder dogging and a VD alarm kit to prevent unauthorized egress. For 3 foot door opening. 98 Series features smooth mechanism case, 99 Series features grooved mechanism case. Device ships Exit Only/Dummy Trim/Night Latch. Field selectable. Trim not included.